So, usually bread isn’t 100% whole wheat flour, because adding white flour improves the texture and flavor of the loaf so much, and makes it much more like the store-bought bread we are used to eating. 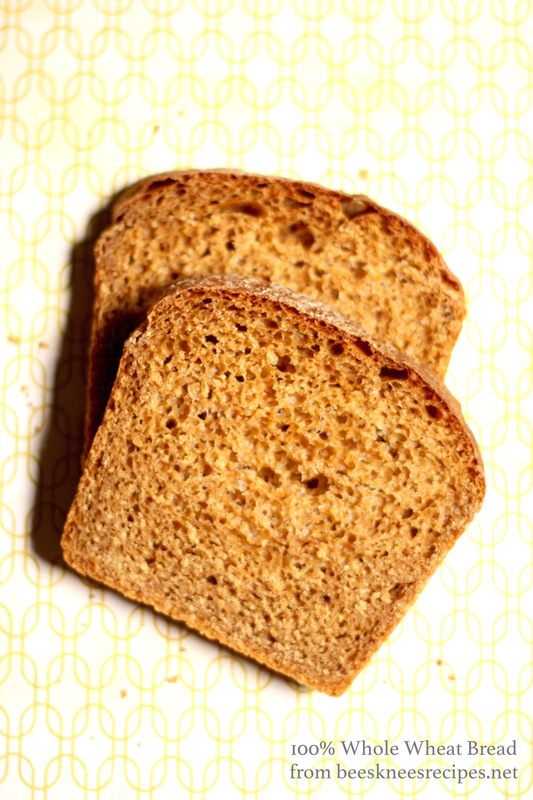 When a bread recipe does make something with 100% whole wheat, it usually adds many unusual ingredients to make it not as dry and to improve the flavor (I’ve seen applesauce, eggs, potato flakes, orange juice, etc). I was surprised to see this recipe voted “Best recipe of 2014” by King Arthur Flour for that very reason. Could 100% whole wheat bread that didn’t have a ton of extra steps and extra strange ingredients be the best recipe of year? Well, it surprisingly is a really great recipe. Not the most mouth-watering thing you can bake, but a really useful recipe, especially when I swing towards the, “my kids are junk-food addicts! NO white sugar or flour for at least, you know, today!” side of the pendulum. On the down side, though, after two days, this loaf was quite dry (still suitable for toast and bread crumbs and croutons), but, as always, bread freezes fabulously, so just pop it in the freezer if you find it partially uneaten within two days. In a large bowl, combine all of the ingredients and stir until the dough starts to leave the sides of the bowl. For easiest, most effective kneading, let the dough rest for 20 to 30 minutes in the bowl; this gives the flour a chance to absorb some of the liquid, and the bran to soften. Transfer the dough to a lightly greased surface, oil your hands, and knead it for 6 to 8 minutes, or until it begins to become smooth and supple. (You may also knead this dough in an electric mixer or food processor, or in a bread machine programmed for “dough” or “manual.”) Note: This dough should be soft, yet still firm enough to knead. Adjust its consistency with additional water or flour, if necessary.